Stir fried Chai Tow Kway is really a Malaysian/ Singaporean street food version of the Cantonese style Loh Bak Koh you find in dim sum restaurant which includes Chinese sausage and other things. This Turnip cake is made plain then stir fried. 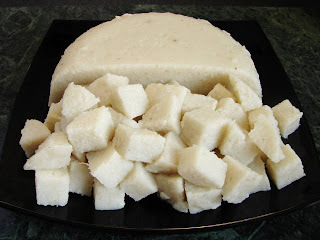 You can either make the turnip cake yourself see recipe below or buy a lump of the steamed cake from Chinese supermarket. Grate the mooli fine as you can (I use a coarse Microplane). If not you can blend small chunks the mooli in a food processor to a smooth paste. Cook the grated/blended mooli in a large pan till hot and bubbly. While the mooli is cooking, mix both flours with water. Pour the flour batter into the mooli add remaining ingredients. Continue cooking on gentle heat and stirring all the time till the mixture looks like thin porridge. Heat off. Grease a large Pyrex casserole, about 2 litre size. Pour mixture into dish and smooth the top. Steam for about 1 hour or till cooked through. Take the cake out, cover and leave to cool completely or overnight. Cut the turnip cake into chunks. Chop preserved radish. Chop chillies and spring onion too. Heat wok with some oil and stir fry turnip cake and chopped radish for couple of minutes till hot. Add dash of ketchup manis and soy to taste, add beaten egg and fry till egg is dried. Add bean sprouts stir briefly then add spring onion and chilli. Plate up and sprinkle on some more chilli and spring onion if you wish and some crispy shallot. 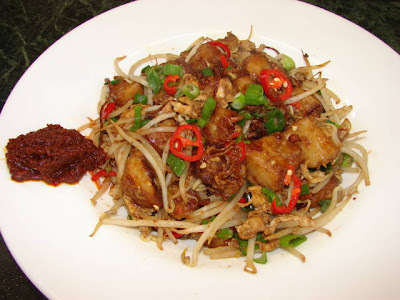 Eat with a dollop of sambal tumis or some chilli sauce.